Thursday turned into a fireworks display on Lake Erie, as the two biggest power bats in the system both connected for two home runs each to help the Sea Dogs off to a 10-2 lead. Michael Chavis and Bobby Dalbec went back to back in the first inning, with Chavis connecting for a two-run shot. Dalbec then delivered a solo blast in the fourth, followed by a Chavis solo shot the following inning. All the more impressive was that all four home runs came off of 2017 first-round pick and former Florida Gators ace Alex Faedo. Chavis got off to a slow start after being activated following his 80-game suspension, but he has been on fire recently. In seven games since the calendar turned to August, he is 13 for 24 with three homers, two doubles, four walks, and only three strikeouts. Easy to miss in the Chavis/Dalbec derby was a strong three-hit evening by Tate Matheny. Dedgar Jimenez turned in a strong start, allowing two runs in six innings and striking out seven, departing with an eight-run lead that seemed well in hand. The Portland bullpen was a roller coaster, with Trey Ball turning in a very rough outing. Ball surrendered five runs (four earned) in his one inning of work, causing his ERA to rise to 7.54 on the year. Salem fell despite having each member of its lineup reach base. Jerry Downs led the offensive attack, going 3 for 4 with a walk, two runs scored, and an RBI. Tanner Houck allowed more than two runs in a start for the first time since July 12, but still had several positives to take away on Thursday night. In all, the 2017 first-round pick allowed four runs on seven hits in five innings. However, Houck struck out seven, walked only two, and induced seven groundball outs. 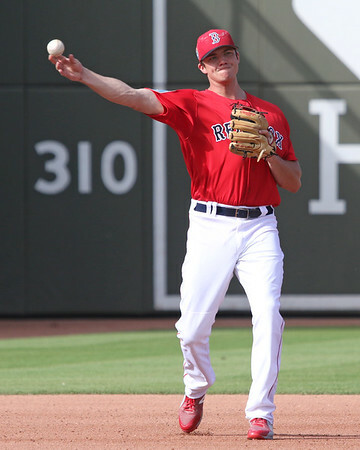 Austin Glorius returned to Salem after rehab stops in Greenville, Lowell, and the GCL. Glorius allowed a run on two hits in his inning of work. The subject of Ian Cundall's Scouting Scratch posted earlier in the day, Durbin Feltman fired a perfect ninth, striking out one and throwing eight of 12 pitches for strikes. Jarren Duran continued his incredible debut, leading the way in the Greenville romp. Duran was 2 for 5 with two runs scored, a stolen base, and an RBI. His hitting streak has now reached 20 games, and he is hitting .452 in seven games since a promotion from Lowell. Pedro Castellanos also continues to roll. The first baseman picked up two more hits, giving him five straight multi-hit efforts. Castellanos is 17 for 33 to start the month of August. Angel Padron cruised through six innings, allowing one run on five hits. 2017 sixth-round pick Zach Schellenger followed with his South Atlantic League debut, striking out two in a hitless seventh inning. The teams were knotted at 1-1 through regulation until a four-run outburst in the top of the 10th propelled the Spinners. After a Tyler Dearden base hit broke the tie, Devlin Granberg blasted a three-run homer to break the game open. It was Granberg's second hit of the night and third home run of the year, as the sixth-round pick raised his average to .315. Starter Yorvin Pantoja turned in a solid effort in the matinee, allowing just one run on three hits in five innings, striking out seven and walking three. Converted catcher Danny Bethea got the win in relief, allowing just an unearned run in two hitless innings. The 2018 season in the GCL South Division has generally consisted of the Red Sox and two other division rivals moving in and out of first place based on who has most recently gotten to beat up on the Orioles squad. After 43 games, the Sox are 15 games up on the O's and now in sole possession of first place in the division. Every member of the starting lineup recorded at least one base hit. Brandon Howlett was on base four times, going 1 for 2 with three walks and a pair of runs scored. Juan Carlos Abreu and Ricardo Cubillan turned in matching efforts out of the top two spots in the order, both going 2 for 4 with a walk and two runs scored apiece. Ryan Fernandez picked up his first pro win with a strong effort in relief, giving up just one hit in three scoreless innings while striking out six. It was a rough afternoon for the Red Sox1 squad, but there were highlights on the offensive side. Leonel Jimenez had a big day, going 3 for 5 with a double, two RBI, and his 12th stolen base of the year. Carlos Sanchez, Wilker Vargas, and Lewis Baez each doubled as part of two-hit afternoons. It was the sixth double and 11th extra-base hit in 17 games for Baez. The other DSL team fell in the totally opposite way, turning in strong pitching performances but notching only three base hits. Bryan Lucas struck out five while giving up a pair of hits in two scoreless innings in his start. Robinson Parra was saddled with the loss in relief, despite giving up just one run on one hit in four innings of work. Parra struck out five and walked four. Richardson Jimenez struck out three in three innings, allowing two runs, both unearned. Player of the Day: It has been a season that has defied all conventional wisdom, as Bobby Dalbec continues to do Bobby Dalbec things at increasingly remarkable paces. After setting the Salem franchise record in home runs in just four months, Dalbec has blasted four homers in six games since his promotion to Portland. His two homers give him 30 for the season, and 16 since June 29. To put that into perspective, his current teammate Michael Chavis led all Red Sox minor leaguers with 16 home runs for the entire 2016 season.